Not a golfing blog. Not a blog about me. 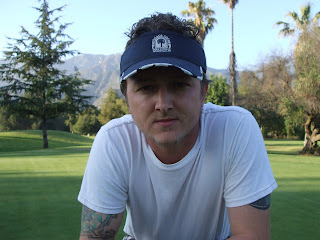 A blog about me, golfing. First, business...I declare both Marni and Deborah winners of the horrifying "Dress Your Caddy" Contest. Fat Witches will be on their way as soon as I get the horrible, haunting vision of Marni's entry out of my mind's eye. Second, I realized the other day that WRITING about playing golf was actually eating into my time playing golf, in that mornings and afternoons are times when I can often practice, but instead I've been using them to write this crazy stream of stuff. I will occasionally post video, pictures, etc. if the mood strikes me. You never know. So unlike most blogs, which just fade out like the end of Hey Jude, I'm going to bring it to a dignified end, like My Sharona. The 'dress your caddy' contest is coming down to the wire, and it seems that the 'chippendale's' theme is pretty much the dominant idea. And I'm in the perplexing situation of possibly awarding two prizes...are they both brownie-worthy? And yes, there will be golf on sunday, location tbd. Let's see if HT can keep it under 100 again! Which I will share with you now. Brace yourself. Possibly NSFW. Possibly NSFDC (Not Safe for Drinking Coffee, because you might blow some out of your nose or mouth. I want to point out that not only is he forced to wear a giant sundae like a sandwich board in front of him AND make your golf bag levitate, he also has ice cream on his head. Ice cream on his head. I'm still trying to figure out what the deep, dark (or not so dark) Freudian meaning of that is. It could be an inner desire for ice cream. On the plus side for him, he does get to wear pants, so the degradation that comes from having ice cream on his head is offset a little by the pants. Then again, I could be wrong. Maybe he's happy with his station in life: caddy (and ice cream serving receptacle) by day; stripper by night. How does he have time to finish that degree in astrophysics? Anyway, I just want to say that this entry is going to be difficult to beat. Yet I said I'd keep the contest open til Friday, and keep it open I will. So action is picking up on the new poll. So far "Chippendale" is the leading new feature that readers would like to see. I guess my question for you who answered it that way is whether you envision them wearing their bowties and g-strings while caddying you or something else. And are they allowed shoes? So here's the contest: either in comments or by email (which I will put in the comments), tell me how you'd dress your caddy. The answer that entertains me most will get a box of Fat Witch brownies delivered to your door, but only if I get some good answers, people. So there you go. Have at it. The Human Torch is, um, on Fire! If you're not familiar with the geography of the Pasadena area, it's at the edge of a valley and about 20 miles in from the coast. This occasionally produces a weather phenomenon known as getting hotter than five blue hells. To be fair, yesterday was more of a 'four blue hells' kind of day, with the temps barely cracking 105. Every few years, we get a flare up that goes even a little higher than that, and let me tell you, Poppin' Fresh stays out of town for fear of crisping. You know what else was hot yesterday? Human Torch. We played the truly beautiful Brookside Golf Course in the even more beautiful Rose Bowl. Why don't we pause a moment and orient ourselves to the setting? Yes, I think we should. There's the stadium in the foreground, and all the green space behind it. If you look, there's a channel running through the valley, and the golf courses are all around it. If you look even closer, you'll see me at the edge of the channel, fishing my ball out and waving at the camera. Anyway, Human Torch, responding to the heat the way a Radiation-themed Superhero would respond to a giant radioactive meteor or the way an undersea, Aqua-Man like Superhero would react to being through in the ocean, had a great game. I had precisely two highlights: first, I birdied a 300 yard par 4. The recipe is this: 280 yard, dead-straight drive, chip shot onto the green, 1 putt. That's the first time any of our little gang has done that on a par 4 or higher. Woo hoo! I also hit my ongoing goal of 2 putts per hole. Small victories, people. Ok, so tomorrow, we'll move on to the subject of The Slowest Golfers In Northwest LA County (and perhaps beyond). No, it wasn't us. I shot a birdie on a par 4. Another first for our little group. Mercuryboy shot very well, but the forward tees were just a few yards ahead of us, so it was a challenge for him. He was the only kid out there. Tomorrow I'll tell you about the four slowest golfers in LA. Yep, we played behind 'em. 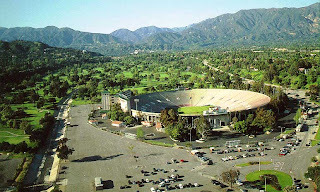 Actually Mercuryboy and I are playing at Brookside (in the spectacular Rose Bowl) tomorrow. I'll grab some pictures at least. I'd recommend you read the intro. There's a money-back guarantee in it! Which of these things would encourage you to golf more? Make 'Golf is the New Chili's' Come to You! What? There's no golf course at disneyland?